They might not be as informative as that one new shot in that Korean commercial, but Entertainment Weekly has released a bunch of new still from The Force Awakens for us to over-analyze—including the first good look at the evil General Hux. Shall we? 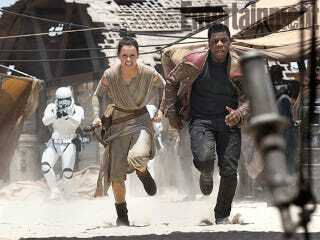 Obviously, that’s Rey and Finn running from The First Order above. Not much to say about that. Darn tiny humanoids who live on desert planets and their penchant for capturing loose droids! Honestly, I have no idea who that guy is, what he’s riding, or why he felt the need to capture BB-8, but I love the design here. Feels very authentically Star Wars-y. C-3PO and R2. Obviously, Threepio has a new red arm—presumably he lost his original in some kind of adventure during the 30 years between Return of the Jedi and The Force Awakens, but note the black highlights on Artoo’s arms, too. That TIE Fighter has seen better days. I assume it’s Finn’s, except 1) I have no idea how he could survive that crash and 2) regular Stormtroopers don’t pilot TIEs. Maybe he stole it? That would explain why he’s terrible at driving it. Kylo Ren in all his Sith-y glory. I don’t care how impractical that lightsaber guard is, it is badass. Entertainment Weekly has a few more photos here, if you’re so inclined. There’s a pretty great shot of Captain Phasma, for instance, and EW says her name as “an unexpected origin.” Any guesses?